If you’re planning to host a party or event, it may well be useful for you to know that hiring caterers to prepare, cook and serve the food can give you more time to socialise with your guests and leave you less stressed out. 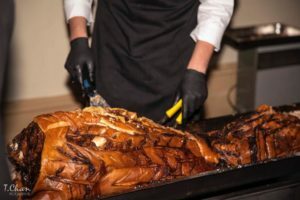 Hiring a Hog Roast Burnham on Crouch chef and team members will also ensure that you and your guests are provided with delicious morsels of food and excellent service from start to finish, and that’s from the first phone call or visit you make to us. We’re here to make your life easier and feed you and your guests homemade goodness, regardless of the type of occasion you’re organising. You’re in charge of the menu for your function, so if you have any ideas or if you want to mix and match items between our own current menus, just ask us how to do this. We work together with our customers so that wants and needs are adhered to, and that’s whether you want a particular food served due to personal tastes or if you need something served due to dietary restrictions. We love to give you variety and choice so you have all kinds of main courses to choose from, as well as sides, starters, desserts, alternative dishes and so much more. For their wedding feast recently, Jonah and Helen asked us to cook our pigs in buns for fifty guests, to serve buffet style together with various salads and two potato dishes, as well as a selection of our handmade desserts. On the morning of their big day, our friendly Hog Roast Burnham on Crouch team headed to the hotel venue and set up our equipment several hours before service and before the couple had even married. We need plenty of time to prepare the meat and then cook it slowly at a low temperature for a long time, so that it cooks through and through properly. By 2pm, Hog Roast Burnham on Crouch had roasted a fresh, local hog to be carved into pigs in buns, put together some lovely salad dishes including our homemade coleslaw, a Greek salad and a tomato and mozzarella salad, and cooked skin-on jacket potatoes and new potatoes with herbs and it was finally time to serve. Once we had wowed the guests with the main, we knew they would love our desserts too! Hog Roast Ingatestone Birthday BBQ Catering! Hog Roast Thaxted for a Detective Themed 40th Birthday Party!